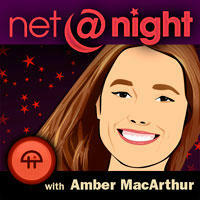 This week Geoff was on the net@night with Leo Laporte and Amber MacArthur. A great discussion about being and independent artists and making a living in the modern age with the internet as the main delivery platform for entertainment content. Geoff also improvises and makes a small song on the fly for Amber. This entry was posted on Thursday, February 5th, 2009 at 6:53	by Administrator and is filed under Interviews. You can follow any responses to this entry through the RSS 2.0 feed.